Quebec City, 1955. Nelly Maloye (Rachelle Lefevre), an ebullient novice detective, accidentally crosses paths with Simon Picard (Colm Feore), an ambitious research assistant in anthropology at the local university. 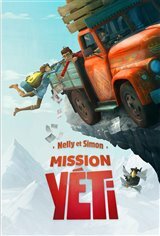 Backed by a glory-seeking philanthropist, the intuitive but disorganized Nelly and the methodical, obsessive Simon set off on a wild adventure, determined to prove the existence of the Abominable Snowman. To achieve this goal, Simon relies on the coded diary of a missing explorer - a diary that should lead them to the mythic creature's lair. Accompanied by Tenzig Gombu, a clever and enigmatic young Sherpa guide, and Jazzmin, a talkative myna bird, our heroes confront a host of dangers in the heart of the Himalayas as they seek that legendary beast: the Yeti.